Heat oven to 375°F. In small bowl, place 1/2 cup of the dry cake mix; set aside. In medium bowl, stir together cookie mix, remaining 1/2 cup cake mix, 1/2 cup butter and the egg until soft dough forms. Shape dough into 20 (1 1/2-inch) balls. Roll in reserved cake mix, coating completely. On ungreased baking sheet, place balls 2 inches apart. Bake 8 to 10 minutes or just until set. (Watch closely to prevent cookies from getting too crispy and overbaked.) Cool 1 minute; remove from baking sheet to cooling rack. Cool completely, about 15 minutes. In medium bowl, beat cream cheese, 6 tablespoons butter, the vanilla and dry pudding mix with electric mixer on medium speed until blended. Gradually add icing sugar, beating until frosting is light and fluffy. 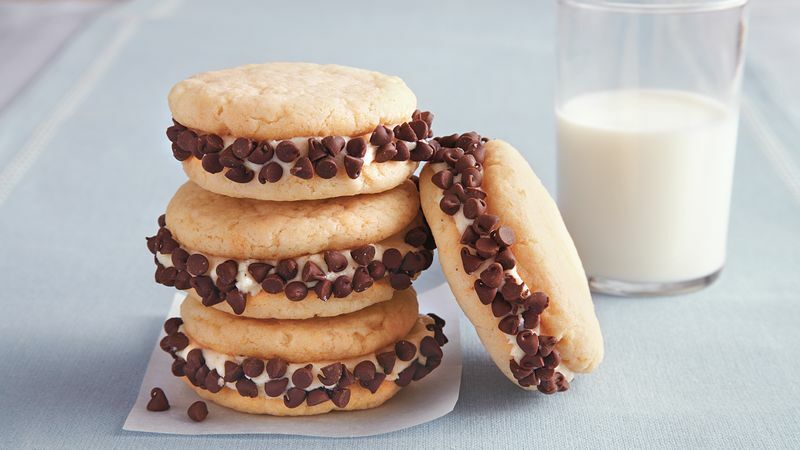 For each sandwich cookie, spread 1 1/2 rounded teaspoons frosting on bottom of 1 cookie. Top with second cookie, bottom side down; gently press together. Roll edges of cookies in chocolate chips. Use another variety of cake mix in place of the golden cake mix, if desired. Save time by substituting your favourite flavour of Betty Crocker™ Whipped frosting for the scratch frosting.